Herbert Park Hotel is located 2kms South of city centre in the "Embassy District" of Ballsbridge, Dublin, enclosed by "Eden" of green trees and parklands. 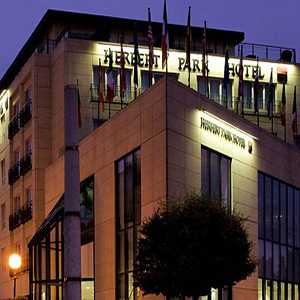 The Herbert Park Hotel is located in the heart of Dublin 4 Ireland. This luxury 4 star hotel is overlooking the 48-acre Herbert Park and it is only 100 m from the RDS and 5 minutes' walk from the Aviva Stadium. 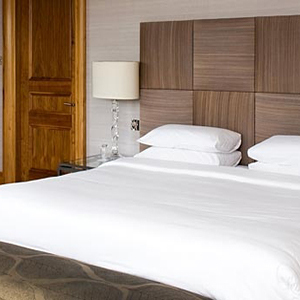 This 4 star hotel in Ballsbridge Dublin 4 offers 153 beautifully appointed bedrooms all finished to the highest standard. The hotel rooms offer stunning views over Ballsbridge and Herbert Park blending the ideal combination of elegant style and modern convenience making it the ideal for those seeking accommodation in Ballsbridge. The 4 star stylish and modern Herbert Park Hotel in Dublin 4 provides a host of award-winning and modern dining options to offer a unique and enjoyable experience for all of its guests. The Bar is one of the perfect places for relaxing and is situated in the heart of the hotel offers the ultimate in comfort and relaxation. It offers an extensive selection of cocktails and premium brand spirits. The Bar is open Monday to Sunday from 12 noon until close. The Irish capital city Dublin is a concert-goers and music fans' dream destination. One can choose from seeing any number of internationally acclaimed artists performing in a variety of Dublin venues such as 3Arena, Bord Gáis Theatre, Olympia Theatre and many more. The above mentioned Dublin's entertainment venues are in close proximity with this hotel and they are easily accessible. The Herbert Park Hotel is an ideal Dublin city hotel with great hotel accommodation for the many Sport events occurring throughout the year. The sport venues are just a few minutes from the Hotel, the place is an excellent choice if you are attending a sport event in RDS, Aviva Stadium or Croke Park. This hotel in the heart of Ballsbridge Dublin 4 Ireland is an ideal venue for conference, meeting, product launch, funtion and events.